There are funny movies. And there is Used Cars. Watching a comedy is always a big risk, as so few of the films advertised as laugh-riots are able to even induce a glimmer of giggles, and I have gotten so used to being disappointed, that I only really hope for a comedy having at least a couple of jokes that will make me laugh. But nothing had prepared me for the all out laughaton that Used Cars delivered, with one golden line of comedy slapping the tail of the next one, in a two hour stream of hilariousness. Strangely, this film was never a big hit, apparently being drowned out by the success of Caddyshack and Blues Brothers, which came out the same summer. 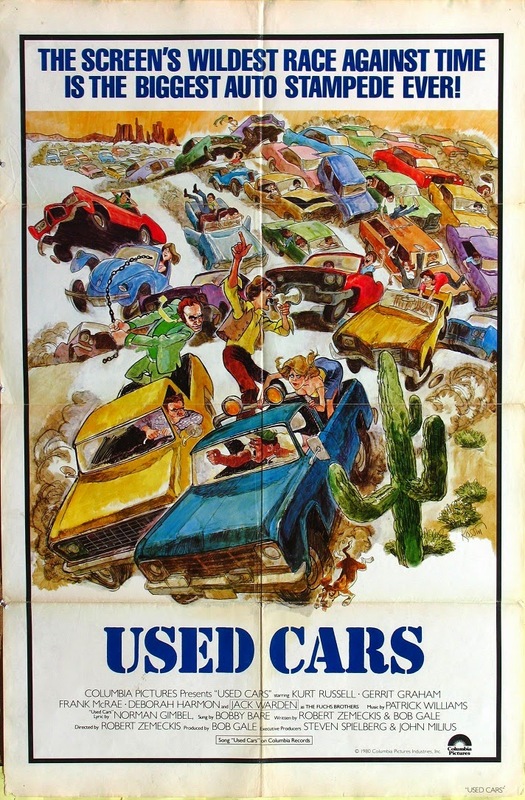 Thus largely unknown, Used Cars is rarely found on anyone's list of top comedies, which makes it the perfect surprise all movie buffs dream of stumbling upon. As I believe the best way to watch any movie is to know as little as possible about the plot beforehand, I will not reveal anything other than what is obvious in the title and poster. The fact that it was written and directed by the legendary Robert Zemeckis, should be enough of quality assurance on its own, but if not, then let me tell you that Used Cars is like the American equivalent to Monty Python at their very best. This film also has an alternate commentary track by director Robert Zemeckis, writer Bob Gale and lead actor Kurt Russell. It's almost as funny as the movie itself, and should not be missed.